SSH, a leading masterplanning, infrastructure, building design and construction supervision firm in the region, is working towards its goal of winning a Leadership in Energy and Environmental Design (Leed) Gold accreditation for Package Three of its key Omani project - Oman Convention and Exhibition Centre (OCEC). Leed certification is official recognition that a project complies with the requirements prescribed within the Leed rating systems as created and maintained by the US Green Building Council. 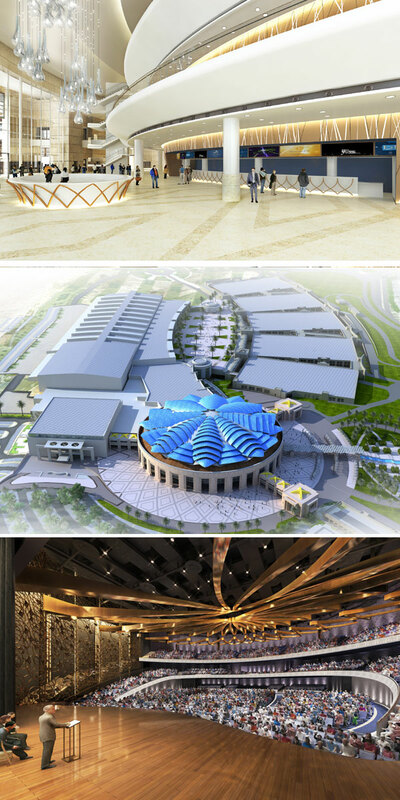 Since the 2016 completion of construction of Package Two - comprising the 45,000-sq-m exhibition centre, 4,200-space car park and associated landscaping - Omran, the state-owned master developer of major tourism, heritage, urban and mixed-use projects in Oman, employed SSH to move straight onto Package Three, the convention centre portion of the project. The convention centre design includes a 3,200-seat lyric-style theatre with two galleries, a second 450-seat auditorium, 19 meeting rooms with full audio-video installations, a grand ballroom with 1,200-seat banquet capacity, a junior ballroom with 540-seat banquet capacity, a food court, and associated back-of-house facilities. Like Package Two, which was officially accredited with Leed Gold certification from the Green Building Council in the US in 2017, Omran and SSH are also seeking Leed Gold accreditation for the convention centre phase of the scheme. SSH was originally signed up in 2010 as the engineering sub-consultant for the OCEC Package Two Exhibition Centre design stage, preparing final design and construction documentation for tender. Subsequently, in 2012, SSH was made the architect and engineer of record by Omran and in that capacity the company completed the detailed design and construction documentation for the convention centre phase, together with the site infrastructure and hard and soft landscaping designs for the project. This fully integrated precinct developed by Omran within the development zone of Madinat Al Irfan – a world-class, urban mixed-use development – is located just 4 km from Muscat International Airport. The exhibition centre has hosted well over 100 events and seen more than 750,000 visitors walk through its doors, marking OCEC as a truly iconic development with a global profile. The award of Leed Gold Certification also cements the building design’s sustainability credentials, said the top master planner. This rating system evaluates the environmental performance of a building and encourages market transformation toward sustainable design, said the statement from SSH. With a perfect score for water efficiency, the OCEC exhibition centre Package Two achieved an overall credit score of 65, exceeding the threshold for Leed Gold Status. Omran said it aims to mirror the Leed Gold success already achieved for the Package Two facilities with a similar Gold award for the convention centre phase of OCEC, and SSH is responsible for ensuring that this target is achieved. "Design integrity has always been a priority for SSH and we have a proud track record of involvement in design-led landmark projects," remarked Danny Warde, the resident director of Oman at SSH. "We have always promoted the seamless integration of all design elements, including structural materials, mechanical and electrical systems, interior finishes and landscape features. It was, therefore, crucial to us that all these elements are interwoven into the architectural fabric of this particular project to provide our clients with beautifully balanced architecture and a sustainable, cost-effective building," he stated. "To repeat the Leed success we saw with the OCEC exhibition centre for the OCEC convention centre would be a proud moment for our client, Omran, and for SSH in Oman," he noted. OCEC is the first significant venture for Oman into the meetings, incentives, conferences and exhibitions markets, said the statement.